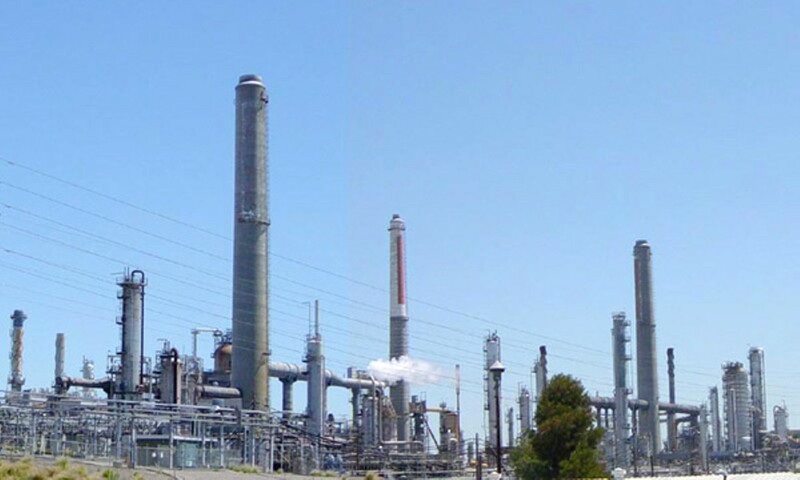 The Shell refinery in Martinez. California Watch is a project of the nonprofit Center for Investigative Reporting in Berkeley. Contact the authors at BYeung@CaliforniaWatch.org and SRust@CaliforniaWatch.org. For more, visit CaliforniaWatch.org. Poor, urban, and minority residents are most at risk for health problems linked to climate change, according to a new California Department of Public Health analysis of Los Angeles and Fresno counties. The department examined social and environmental factors ranging from the rising sea level to public transportation access and found that African Americans and Latinos living in these counties are more likely to be exposed to health and safety risks related to poor air quality, heat waves, flooding, and wildfires stemming from climate change. "Clearly, climate change risks are not equal across the state or within individual counties," according to the report. "Identifying communities at greatest risk is a necessary step in efficiently employing limited resources to protect public health." In Los Angeles County, neighborhoods near Santa Monica and Long Beach were among those deemed most vulnerable, "largely from risks due to sea level rise, but also partially attributable to poor public transit, wildfire risk, and a large proportion of elderly living alone," the report said. The study also found that there was a notable economic disparity between families living in the areas most vulnerable to climate change and those who didn't — the more at-risk families earned between 40 and 55 percent less each year than the least vulnerable families. Residents living downtown or in urban areas were also more vulnerable, the study said. A western portion of Fresno County near Mendota also was found to be especially susceptible to climate change-related safety and health problems. Public health experts say these disparities in climate-related health risks can partially be explained by living conditions and a poor baseline status of health. "If you are low-income, you may live in a facility that is in poor repair, and you can't open the windows, or you don't have air conditioning. Then you may be more at risk for heat-related activity. It's the same with the cold," said Dr. Georges Benjamin, executive director of the American Public Health Association. "The fact is that low-income communities, especially those of color, start with a health deficit. No one does well with bad air quality, but when you have poor health status, you're going to be more at risk." Across the country, public health departments have become increasingly focused on the connection between health and climate change. The California analysis – the first to look at climate change health and safety risks at a county level — is based on a methodology developed by researchers at Occidental College in Los Angeles, the University of Southern California, and UC Berkeley, and is part of an effort to help local officials plan and identify potential policies for handling the human health impacts of climate change. "Given that climate change presents a suite of risks and not a single risk, this is more of a planning tool for identifying which communities you should be taking some time to make sure you address," said Manuel Pastor, who directs USC's Program for Environmental and Regional Equity and advised the state health department analysis. "You look at a map like this, and you see the areas that need more support. It could inform different preventative and emergency response strategies." A bill introduced in November by California Democratic Congresswoman Lois Capps also calls for the development of a national strategic action plan to respond to "rising health threats from climate change." These efforts have been applauded by the American Public Health Association. "If you think about the history of public health, our history has been all about making sure that the water is safe to drink, the food is safe to eat, and the environment is safe to be in, and all of those things can be disrupted with climate change," Benjamin said. But climate change skeptics say California's climate-and-health analysis is misleading and unnecessary. Richard S. Lindzen, a professor of atmospheric sciences at the Massachusetts Institute of Technology and a prominent climate change skeptic, said the issue is often erroneously conflated with extreme weather or natural disasters. "In California, if you have extremes of warm or cold weather, it's not due to global warming; it's due to which direction the wind is blowing," Lindzen said. Public health departments are merely "coming along for the ride," he said. "As far as I can tell, the global warming impact on California health has to be immeasurable at this stage." UC Berkeley physics professor Richard Muller, a onetime skeptic who changed his position on climate change after conducting research funded by other skeptics, said that while "there is evidence of climate change that is visible to scientists but not to the everyday person," the state public health department's analysis is of limited use. "It's certainly true that the poor people of our state are always the most vulnerable to any change whatsoever — you don't have to do an analysis to figure that out," he said. "If you want to spend money on the poor, I suspect preparing for climate change is the least effective way to do that. The poor will always need help, and I don't think it should be spent on something like a fad like climate extremes and predictions that things might get worse." The Union of Concerned Scientists disagrees. According to a 2011 study, California would experience the "biggest economic impacts and the biggest heath impacts when ozone and temperatures increase" due to climate change, said Elizabeth Perera of the union's climate and energy program. That study projected that an increase in ozone pollution would result in about $729 million in related health care spending in California in 2020. New research shows it can pay to be green. A pair of California business school researchers has found that companies that disclose greenhouse gas emissions enjoy an immediate rise in stock value and positive returns to shareholders. "When a company makes a voluntary disclosure of this kind, it signals to the investment community that this is a firm that is environmentally responsible," Paul Griffin of UC Davis told The Daily Climate. "Investors are saying they would prefer to invest in an environmentally responsible firm." The pair wanted to test a theory known as "voluntary disclosure." The theory predicts that certain corporate information, if disclosed judiciously, will produce a benefit for shareholders. The theory also predicts that the disclosure of that information will benefit smaller companies — or companies with less information available about them — more than larger companies. So the team, which also included Yuan Sun of UC Berkeley, went through all news wires released by Corporate Social Responsibility, a corporate news wire, between 2000 and 2010.The researchers chose this news wire for two reasons: 1) They wanted to track only companies that voluntarily disclosed their emissions (as opposed to a regulatory database), and 2) the news wire is considered the global leader in providing news about corporate social responsibility, allowing the researchers to examine a large worldwide sample. The researchers ended up with a sample of 172 greenhouse gas disclosures for 84 companies. They then got company stock values for the day before the announcement, the day of, and the day after. The researchers also set controls by analyzing companies that did not release emissions information during that time period. The researchers found that stock value increased when companies voluntarily disclosed their greenhouse gas emissions. They also found that the benefit for smaller companies was greater than for larger companies. The study showed smaller companies saw an average increase of 2.3 percent in share value after disclosure. To be sure, "independent of company size or public information availability, the tests ... document a small but reliably positive shareholder response to a Corporate Social Responsibility newswire release," the authors wrote. The companies analyzed represented a variety of industries, including health care, information technology and financial services. The researchers hope their data will influence companies to disclose information about their carbon impact. California scientists develop material that captures carbon dioxide.